Longleaf pine seedlings do not like competing vegetation and will stay in the grass stage for years if vegetation is not controlled by fire, mowing or herbicides. Using improved containerized seedlings along with good vegetation management can release longleaf pines from the grass stage in 2-3 years. 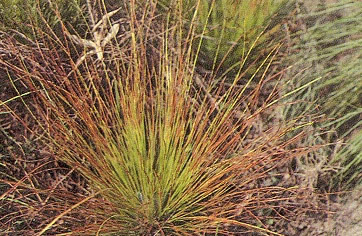 Longleaf pines are the only species of southern pines susceptible to brown spot needle blight. Seedlings are infected in the grass stage and can die from the disease. Prescribe burning is an effective method for controlling this fungus disease. Burning removes the infected needles and kills the spores. Brown spot can be identified by yellow bands on the needles, which eventually turn brown as shown below. December thru March is the typical burn window for this activity. Older longleaf pine stands can be burned into late spring with the right weather conditions and understory. If turkey management is important to you, wait until nesting season is over to burn mature longleaf stands. We get better control of understory brush and hardwoods burning in the spring. The link shown here shows an example of a control burn in 5 year old longleaf pine that is in the sampling stage. Good forest management practices have got these pines off to a good start. The key is not to damage the bud in the tip of pines or the newly formed candles in the spring. *Make sure and get a burn permit from the local state forestry service before you light your fire.